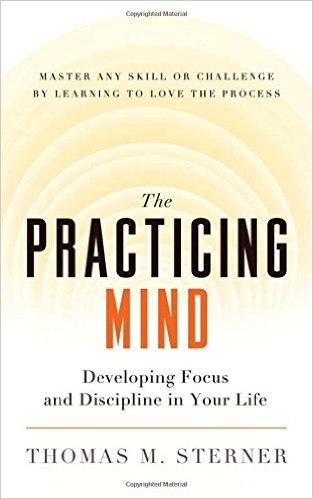 Somewhere between Peak and Zen Mind Beginner’s Mind, The Practicing Mind provides a good framework for thinking about your art in a nonjudgemental way. It helps with the spiritual side of skill development, instead of always just focusing on go go go. We miss the point that the ability to develop any skill as swiftly as possible, with the least amount of effort, and even to experience inner peace and joy in the process, is in fact a skill itself, and one that requires constant practice to become an effortless part of who we are. When we subtly shift toward both focusing on and finding joy in the process of achieving instead of having the goal, we have gained a new skill. And once mastered, it is magical and incredibly empowering. However, the practicing mind is quiet. It lives in the present and has laser-like, pinpoint focus and accuracy. It obeys our precise directions, and all our energy moves through it. Because of this, we are calm and completely free of anxiety. We are where we should be at that moment, doing what we should be doing and completely aware of what we are experiencing. There is no wasted motion, physically or mentally. We have a very unhealthy habit of making the product — our intended result — the goal, instead of the process of reaching that goal. When we practice something, we are involved in the deliberate repetition of a process with the intention of reaching a specific goal. The words deliberate and intention are key here because they define the difference between actively practicing something and passively learning it. (similar to deliberate practice, see Peak). When you focus your mind on the present moment, on the process of what you are doing right now, you are always where you want to be and where you should be. All your energy goes into what you are doing. However, when you focus your mind on where you want to end up, you are never where you are, and you exhaust your energy with unrelated thoughts instead of putting it into what you are doing. Make the process the goal and use the overall goal as a rudder to steer your efforts. Be deliberate, have an intention about what you want to accomplish, and remain aware of that intention. When you remain aware of your intention to stay focused on the present, it’s easy to notice when you fall out of this perspective. At such times you immediately begin to judge what and how well you are doing, and you experience impatience and boredom. When you catch yourself in these moments, just gently remind yourself that you have fallen out of the present, and feel good about the fact that you are now aware enough to recognize it. You have begun to develop the Observer within you, who will prove so important in your self-guidance. If, however, you begin to analyze your progress based on how you play in relation to the soloist’s performance (something that is usually done unconsciously), you are headed for discontentment and may even become so frustrated that you give up on your efforts. We consciously or unconsciously pick a point of reference in whatever we do and decide that nothing will be right until we get to that point. If you step back and observe your internal dialogue from time to time during the day, you will be amazed at how hard you work against yourself with this type of thinking. In Zen, this state is referred to as “beginner’s mind.” When you are a beginner in any activity, accomplishing it takes all your concentration, and your mind is empty of chatter. (see Zen Mind Beginner’s Mind).